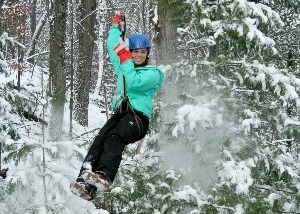 Our Winter Retreat is full of adventure! Whether you love the snow or hate being outside in the cold, you will find plenty of activities to keep you busy in February! Fun, adventure, education, friendship and relaxation await you at our mid-winter escape! Maybe you’ll spend the morning creating a masterpiece! Take a guided painting workshop, or try your hand at making a rustic wooden sign, hand-stamped jewellery or an authentic dream-catcher. Outdoor Adventure more your thing? If its cold enough, slip on some skates an take the trail around the lake or hop in the rink and have a fun ice hockey game! Cheer each other on as you tackle the snow trails in snowshoes, climb to new heights on the rock climbing wall or take your aim in the archery field! The fun doesn’t stop there! Evenings at Rustic Mama Retreats are filled with entertainment and laughter! From Friday night entertainment to an epic Saturday Dance Party! We’ve got the perfect recipe for exciting evenings! At Rustic Mama Retreats we strive to be affordable and accessible to families everywhere. We don’t want anyone to miss out on the fun! While some retreats offer programming of this kind for $800-$1200, we’ve worked hard to offer great value for a much lower cost! Accommodations are invoiced by Murdoch Travel – TICO #50023330 in accordance with the Ontario Travel Industry Act. 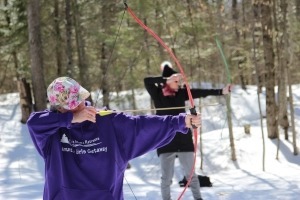 February 8-10th retreat is held at Camp Mini Yo We, which is nestled in the lush Muskoka forest and their 270 acres of property features a private lake, island, natural rock face climbing wall, archery range, a double zip-line, high and low ropes courses and so much more. There are extensive hiking and skiing trails, ice skating rink and even a snow tubing hill. 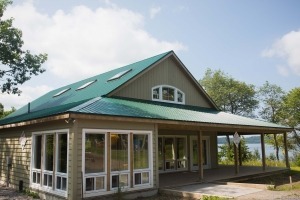 Mini Yo We accommodations include newly-renovated, winterized cabins with electricity and heat. All have full washrooms with sink, showers and toilets. Most cabins accommodate 12-24 people so be sure to let us know if you have any cabin mate requests or come with a large group of friends and have a cabin all to yourselves! Remember to bring your own pillow and sleeping bag. February 22-24th retreat is held at Camp Trillium located just 1 hr outside the GTA. Located on 142 acres, this camp offers gorgeous views of their 35 acre private lake, as well as incredible activities such as rock climbing, high ropes, archery, cross-country skiing, snowshoeing and so much more. 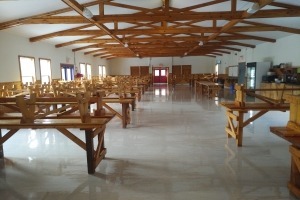 Built in 1998, this facility is modern and has all the amenities of home. 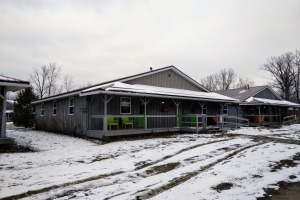 Camp Trillium accommodations feature 8 large accessible winterized cabins with a semi-attached design. There are several rooms within each cabin, which can accommodate groups of 4-16 and all have heat, hydro and several outlets. Washrooms, with showers, are also located inside each section of the cabin as well so no need to wander outside in the middle of the night. 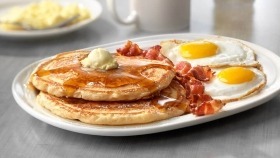 Camp Mini Yo We and Camp Trillium’s very own chefs will provide amazing, nutritious and delicious meals throughout the weekend with both healthy and indulgent options! Meals will include incredible homemade baked goods, vegetarian options and a delicious salad bar. Some wine will be available during the dinner and the evenings but feel free to bring your own beverages for consumption in your cabin if you wish. Typical weather in Winter can be somewhat unpredictable. 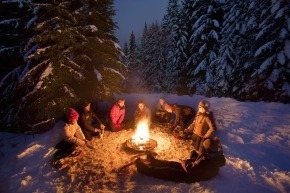 Be sure to bring a warm jacket, boots and hat for night-time campfires as well as several changes of clothes in case the snow gets the best of you! Warmer weather means muck, so rubber boots might be beneficial! Camp Mini Yo We is located in Port Sydney, Ontario. A straight shot up the 400, North of Toronto. Camp Trillium is located in Waterford, Ontario. Just a short drive from the west side of the GTA.